Handsome and substantial, beautifully packaged, solid hooks on back. It is a very clear image- no distortion- I have this at the top of a stair and it looks great. Make sure the mirror, mirror on the wall remains worthy of a beautiful reflection with this elegant full-body floor mirror. 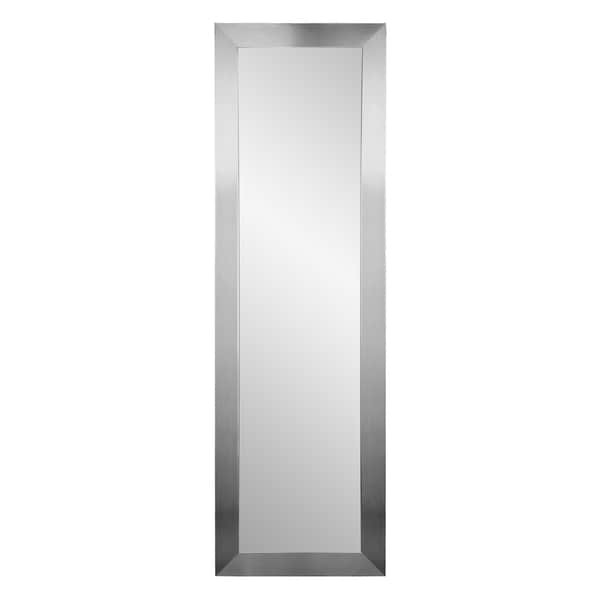 Featuring a nickel-finish silver-hued frame, this charming mirror includes all hardware needed for hanging. Dimensions 4.0 In. X 27.0 In. X 76.0 In. It was very hard for me to find a mirror with the specific dimensions I needed and this was it. It’s a perfect full length mirror and I am so happy with it. Love love LOVE this mirror. Fits perfectly into a smaller space in my bathroom while still being a full length mirror! Beautiful matte silver. "For the 16" size, how wide is the actual mirror?" The mirror is 21.5" x71"; minus the 3" frame and the actual mirror is 16"x65". "For the 21.5 x 71, what is the size of the frame, how wide is it?" The frame is approximately 3 inches wide.